I realize it’s only mid-August, but I’m mentally preparing myself for fall. Fall is always a weird season for me. I love so much about it: apple everything, pumpkin picking, Halloween, Thanksgiving, changing leaves, football. The end of Fall is always disappointing. I hate winter so I try to stretch out fall as long as possible. Which means even though it’s only preseason, I’m in full football mode. And that I’m making fun Sunday dinners while watching the game. This easy dish could be either dinner or a fun appetizer. It was also a lot easier and quicker than I was expecting. It’s basically all the goodness of a taco, shoved inside a bread. 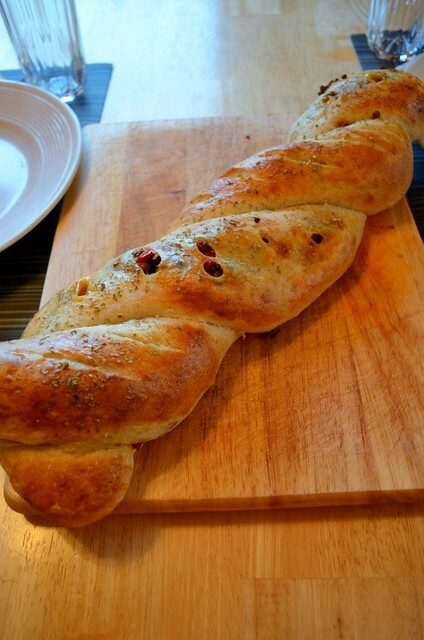 The recipe relies on pre-made dough, but you could use your own favorite French bread recipe. In a large pan, brown the ground chicken. Stir in the taco seasoning, red bell pepper, chipotle peppers, adobo sauce, black beans, salt, pepper and cilantro. Cook another 3 – 5 minutes, until heated through. Remove from heat. On a clean and lightly oiled counter, place the French breads side by side. Using a serrated knife, lightly cut into each loaf from tip to tip. Using your fingers, spread the dough until you get a 4-inch well in the center. Sprinkle the cheese along each well. Divide the chicken mixture between the wells. Using your fingers, pinch the dough tightly, closing the mixture inside the bread. Transfer each loaf to a lined baking sheet, placing them seam side down. Twist each loaf around each other. Lightly brush the twist with the egg wash. Using a small knife, lightly score little slits across the top of the twist, allowing for ventilation.Sprinkle the Mexican oregano on top of the twist. Bake for 30 minutes, or until the top is golden brown and the bread is cooked through. Let cool for 5 minutes before slicing.